Do you have lots of family coming into town for the holidays? Need some crowd pleasing recipes that will stretch and feed many? 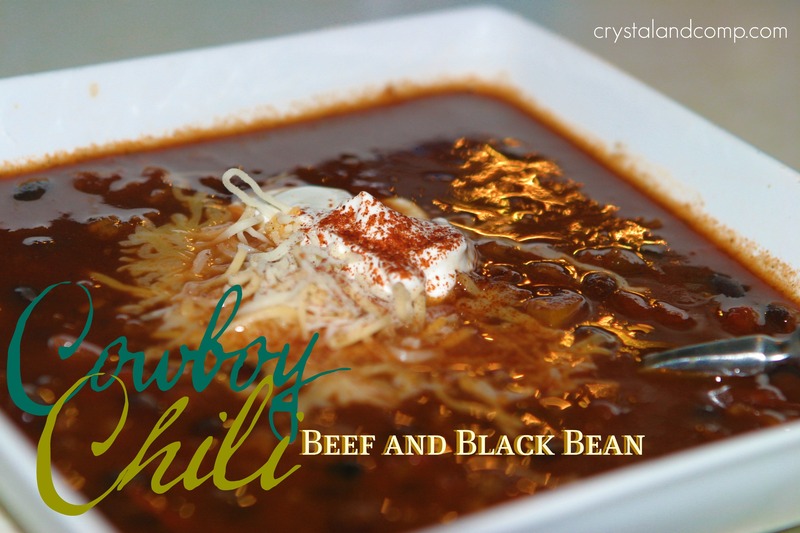 This Texas Beef Council recipe, Cowboy Beef and Black Bean Chili, is amazing! 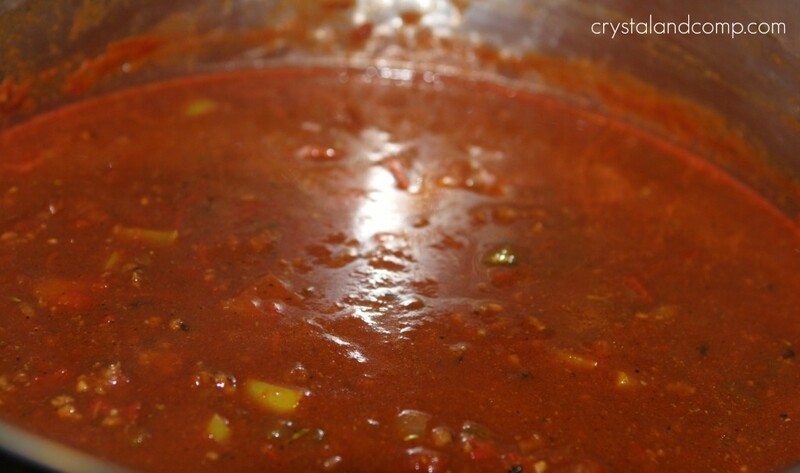 What I love about this chili is that you can certainly adjust some of the ingredients to change the level of heat. I also love to strain the leftovers of some soups and chilis and use them for tacos, burritos, nachos or tostadas. Cook once, serve twice. Don’t let the ingredient list overwhelm you. 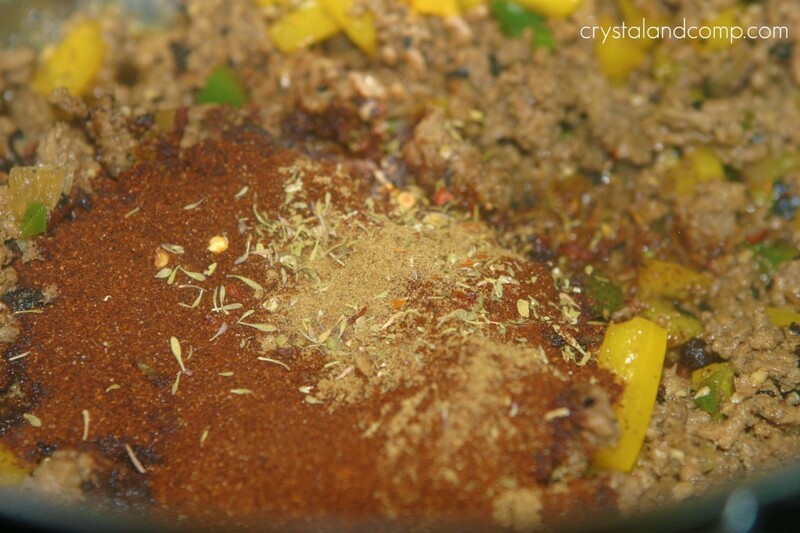 The spices are a common selection that you likely have on hand. Here is my adapted version of the recipe. 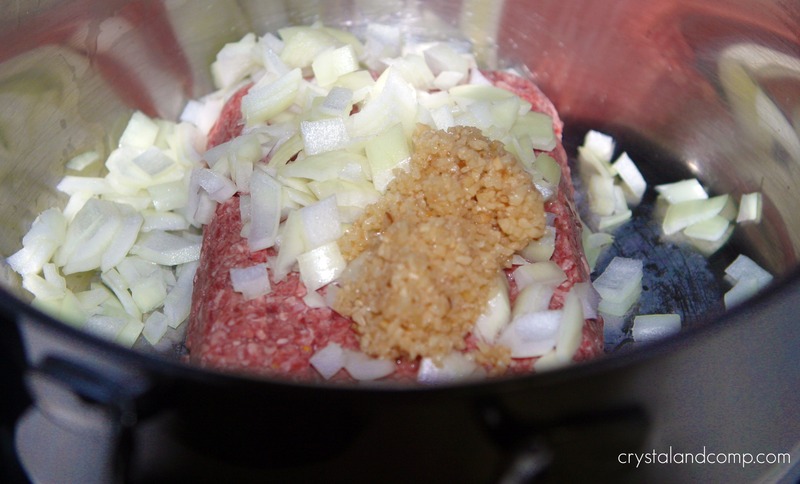 In a pot over medium heat, brown the hamburger meat with onions and garlic. Do not run to the store over the forgotten dark beer and leave your husband in charge. If you do, you will come home to burnt hamburger meat and a conversation that goes something like this. Him: Um, your meat burned. Me: Um, you were coherent when I left and said the meat is on low I am running to the store. Him: It wasn’t on low. Him: I added water to it. Me: Well, who can tell the difference in burnt meat and black beans? Carry on. 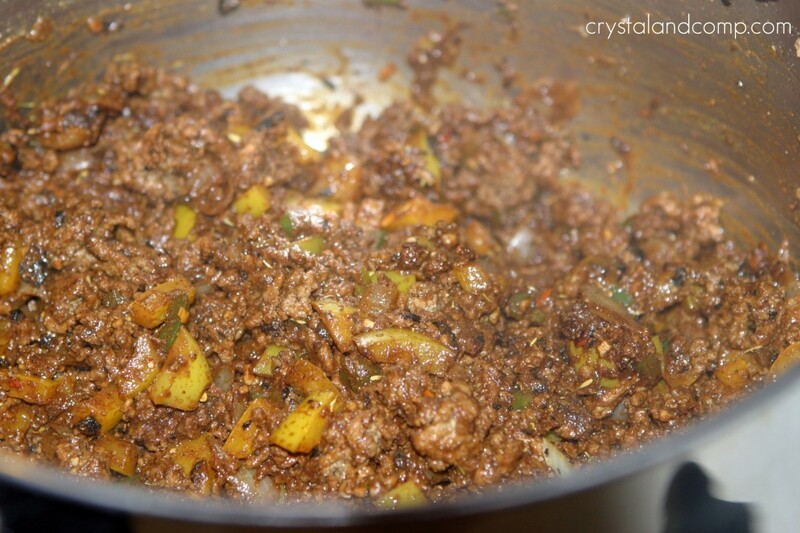 Add the chopped yellow bell pepper and jalapeno. Cook on low until the bell pepper is tender. Add the beef broth, dark beer, crushed tomato, diced tomatoes, honey and tomato paste. Stir and cook for another 15-20 minutes. Scoop it up in bowls and serve. I topped each bowl with cheese and sour cream for those who like it. The sour cream really helped take any heat out of the chili that was there. How do you like your chili? Beans, no beans, no meat? I want to know! I love more beans and less meat. Perfect when you are serving a crowd! 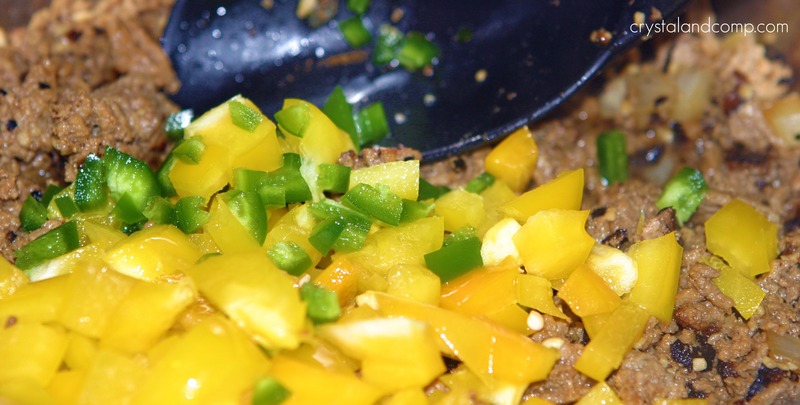 Add the chopped yellow bell pepper and jalapeno. Cook on low until the bell pepper is tender. Stir to combine and cover. Simmer for 45 minutes. 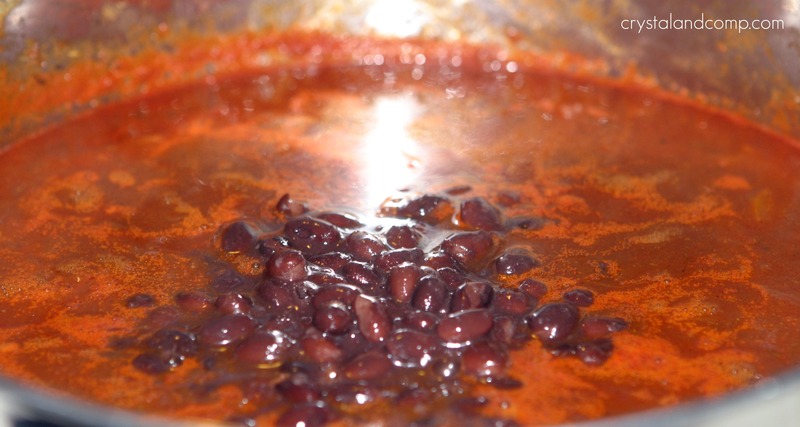 Add the drained beans. Stir and cook for another 15-20 minutes. It looks yummy…I’m going to try it. Thanks, Merry Christmas….I love your blog. Thank Ruby. It was very tasty! Sweet cornbread is the best, isn’t it? I will swing by and share. Thanks for the invite. 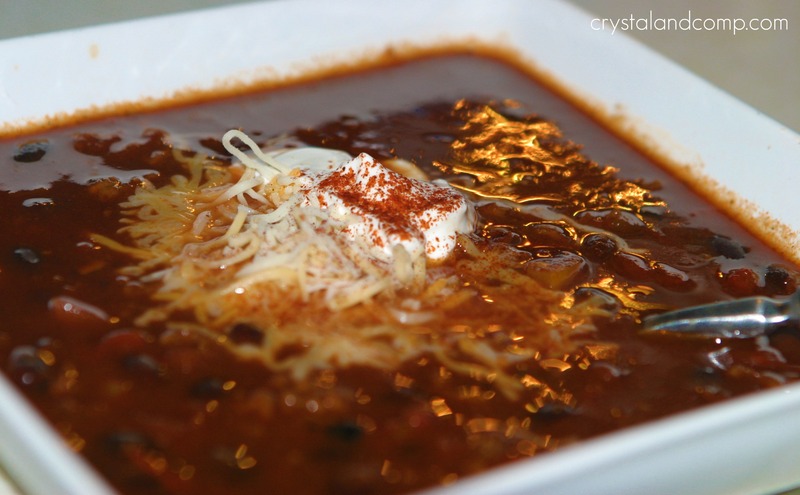 I love the addition of the dark beer and honey to your chili. This is a great recipe and it looks delicious, Crystal. Thank you so much for sharing with Full Plate Thursday. Wishing you and your family a very Happy New Year and Abundant Blessings in 2012! hey! just stopping by to let you know that i featured you this week on Savory Sunday! Happy New Year! Your chili looks wonderful! Thanks for linking up to Tempt my Tummy. This Chili looks delicious! Thank you so much for sharing your awesome recipe with Full Plate Thursday. Hope you have a great weekend and come back soon! the dark beer probably gives this dish a lot of depth. thanks for sharing it on foodie friday. Not able to pin this; this makes me so sad. Why are you not able to pin? There are two ways to pin from my site. Click on the Pinterest button under the post title. It is a long red button that says Pinterest. It is horizontally positioned on the page. Or, hover over any image and a Pin It button pops up. Click that and it takes you to Pinterest as well.